Holden today introduced VE and WM Series II, the latest versions of Australia’s most popular sedans, wagons, utilities and luxury long-wheelbase vehicles. With the new range Holden has finessed the formula that has made Commodore the nation’s top selling car for 14 years straight, introducing smart multimedia technology, improved fuel economy and the capacity to run on environmentally friendly bio-ethanol. Known as Holden-iQ, the system is controlled through a clever, user-friendly touch screen mounted in the centre stack - the cornerstone of a refreshed interior across all models. Introducing increased plug-and-play music functions and the ability to rip and store CDs on an internal flash drive, the system also delivers advanced satellite navigation features on selected models including live traffic condition alerts to help drivers avoid road congestion. Commodore’s smart technology extends to the Series II powertrain line-up which delivers further fuel economy improvements on all models. Holden’s frugal 3.0-litre SIDI V6 now achieves economy of 9.1 litres of fuel per 100 kilometres in the official ADR81/02 test. The 2 per cent improvement adds to the 12 per cent fuel economy gain made in September last year when Spark Ignition Direct Injection engine technology was introduced to the Commodore range. The 3.6 litre SIDI V6 used to power premium Commodore models makes average fuel economy gains of more than 3 per cent while all luxury and performance models powered by Holden’s Gen IV V8 improve on average by more than 6 per cent.The fuel economy improvements also result in reduced emissions across the range with all V6 models now achieving a four-star rating in the Federal Government’s Green Vehicle Guide. In a major step towards creating a cleaner Australian fuel landscape, Series II introduces flex-fuel technology which enables customers to run their cars on bio-ethanol, known in many markets as E85; a blend of up to 85 per cent ethanol and 15 per cent petrol. Bio-ethanol is a cleaner burning fuel made in Australia from the waste bi-product of wheat, sugar, sorghum and eventually even household garbage. In Australia today use of the fuel reduces lifecycle CO2 emissions by up to 40 per cent when compared to petrol. A first for an Australian-made car, Series II models powered by the 3.0 litre SIDI V6 and 6.0 litre V8 engines will feature this flex-fuel capability, allowing them to run on bio-ethanol, E10, Unleaded, Premium or any combination in between. To support Holden’s release of flex-fuel vehicles, leading fuel retailer Caltex has introduced Bio E-Flex, a high-ethanol blended fuel to be sold in Sydney, Melbourne, Adelaide, Brisbane and Canberra from October. Holden Chairman and Managing Director, Mike Devereux, said Series II, which also receives a range of exterior design enhancements, reflected Holden’s focus on continuous improvements for Commodore. “Our approach to Commodore has been about making a great car even better,” Mr Devereux said. “It’s about introducing more improvements more often and getting technology into the car that our customers need and want. “That’s what we have done with VE Series II. “Our customers have been telling us they want to see our models refreshed with greater functionality from Omega to Caprice. Mr. Devereux said the introduction of flex-fuel capability to Series II vehicles highlighted Holden’s commitment to making motoring better for the environment through leadership with alternative fuels. “We have placed an enormous emphasis on developing technology that can be used in today’s vehicles to make driving better for the environment. “That has included leading the way for Australian produced cars with bio-ethanol, providing motorists with a cleaner fuel alternative when filling up their car. The Holden-iQ system brings music, telephone and satellite navigation features to Series II models in one clear, user-friendly arrangement. The focus of the system is a fully integrated, 6.5-inch full colour multifunction LCD touch screen mounted in the centre stack of all vehicles across the Series II range. Featuring rich colour graphics, the display has been benchmarked against high-end multimedia products such as computers, phones and video games, providing a wide range of audio-visual functions. Music can be played via an iPod®, memory stick, CD or wirelessly transferred from a paired mobile phone. USB devices and iPods plug into dedicated sockets located inside the centre console, and all music file playback from compatible devices is controlled via the touch screen. Holden-iQ also introduces ‘virtual changer’ CD storage which replaces the mechanical stacker system from previous models with the capacity to rip and store up to 15 CDs on an internal flash drive. The system supports CDDA, CD-R, CD-RW, MP3 and WMA playback. DVD systems, where fitted, also display on the Holden-iQ touch screen. New Bluetooth® functionality improves drivers’ hands-free mobile phone experience. It synchronies a compatible phone’s address book and recent call history then displays the information on the touch screen. Outbound calls can be made via the contact list or a dedicated touch-screen key pad. The high-feature Holden-iQ navigation system, standard on SS V-Series, Calais V-Series and Caprice models, delivers a high-clarity full colour mapping system, intuitive controls, live traffic alerts, speed advisory and point of interest functions. Voice guidance is integrated into the vehicle’s audio system. It also features a touch screen keyboard to facilitate easy text entry, isometric and 3D map views and on-screen turn-by-turn and audio route guidance. On those same models (except Ute) the touch screen also features a reversing camera display which is activated whenever reverse gear is selected. A strong safety feature, the colour screen display operates in tandem with audible park assist and works to show any obstacles directly behind the vehicle. Holden engineers and designers working on Series II have instituted a series of modifications to produce an average fuel economy gain for all V6 models of 2.8 per cent and an average fuel economy gain for all V8 models of six per cent – making a combined average of just over four per cent across the VE and WM Series II range. Modifications included aerodynamic improvements, which lower fuel consumption by reducing the vehicle’s drag co-efficient, and mechanical changes. Omega and Berlina models were also fitted with lower rolling resistance tyres. 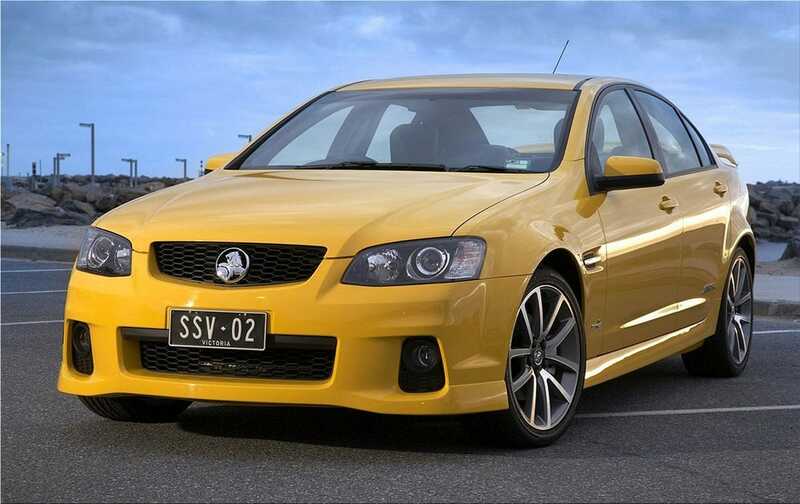 The multi-award-winning VE Commodore made a strong and dramatic design statement, characterised by its classic rear wheel drive proportions and an athletic stance emphasised by striking wheel arches. For VE Series II, designers briefed to refresh the exterior have executed a series of subtle changes, including new front fascia, grille and headlamp treatments across the range. Berlina specification and above feature new alloy wheels and the upper decklids of the sedan models are enhanced with integrated aero lip detailing.On the interior, Holden has continued its trend of creating unique personalities for each model. Mainstream, prestige and sports models all receive new centre stack features, mouldings, decoration and illumination colours.Interior design work has focused on high standards of perceived quality, and creating a more ‘pilot oriented’ cabin integrating new features and accessories.